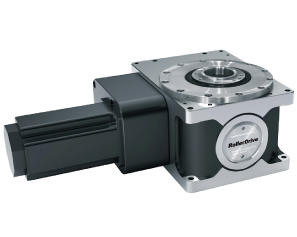 Our RollerDrive is the ultimate high performance rotary positioning unit. It uses a roller gear cam mechanism for excellent precision, rigidity, and durability. The products in this series deploy variations on their collective strengths, to provide qualities that are specialized for each different application. These strengths included high speed, high precision, high torque to drive heavy loads during positioning, and high rigidity to improve processing quality. They are used in a wide range of applications, including positioning machine axes, in grinders for the edges of LC glass substrates, industrial robots that transfer large glass substrates, and positioners for large automobile welders. The RollerDrive using our zero-backlash reduction mechanism can be attained faithful motion without behaivor disturbance against external force. The RollerDrive provides the excellent setting and ensures shortening the tact time. 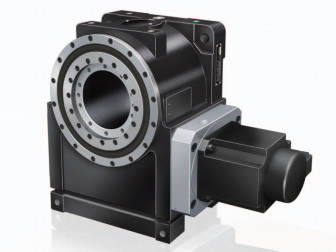 Compaire with 500 kg payload, 43％ thickness direction allows for compactness feature and provides double oversized hollow output shaft. Our proprietary adjustment provides optimum preload and transfer torque while rotating. Therefore this mechanism prevents wear for long-term use and also capable of installing other company's survomotor. The RA Series is a zero-backlash reducer designed for small to medium-size FA applications. It delivers high accuracy, rigidity, and speed. The RA is suitable for equipment that demand motions with a high level of accuracy and speed. The RollerDrive uses a unique preload mechanism to completely eliminate backlash and deliver output motions that are faithfully true to input commands. Positioning accuracy is particularly good with direction reversing motions. Delivers good positioning accuracy and runout accuracy, which are otherwise difficult qualities to attain with a small reducer. The output shaft is a solid-piece cross roller bearing designed for durability against axial and radial loads. Dedicated fittings are available for mounting motors from various manufacturers. Motor couples directly to the input shaft for a direct transfer of power with less transfer loss. Features a compact aluminum-alloy housing for minimal footprint. This enables easy wiring and piping, and a broader range of design possibilities, such as passing the shaft of other equipment through the hole. 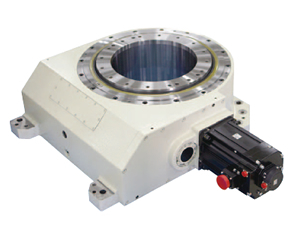 A highly-rigid cross roller bearing with extremely small deflection is built into the output section. This versatile all-purpose model is suitable in variety of industries. It provides both performance--such as precision and rigidity--and functionality--such as a high gear ratio and environmental robustness-regardless of the application. The internal structure was redesigned with a cast iron housing and heavy-duty output bearing for high rigidity. 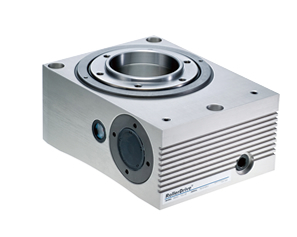 Compatible with a wide range of servomotor sizes (for each brand). Servomotors are coupling-mounted for installation. Easy to install even for first-time users. We offer a water-proof and dust-proof option that uses a special seal for protection against washdown and dust-prone environments. The RollerDrive RW Series is a positioner for welding machines. It holds up against shocks that are caused by high-speed positioning and emergency stopping of heavy loads. 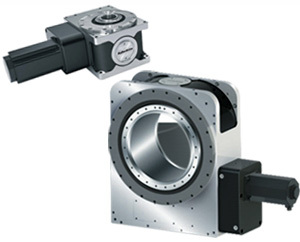 The oversized hollow output shaft simplifies wiring and plumbing to the equipment to be mounted on the output shaft. The low-profile body allows for compact equipment design.